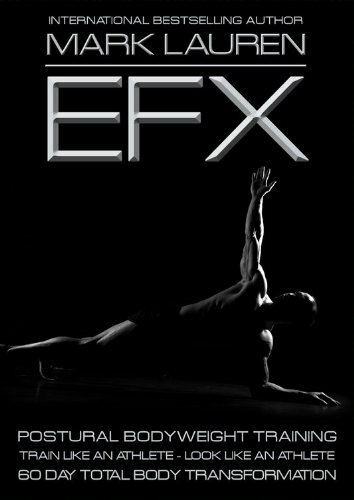 EFX was created by the master of bodyweight training Mark Lauren. I first discovered him when my daughter started college. She was a home workout buff like her mother and was was worried about how she would manage in college since she doesn’t care for the gym environment. One of the many things I got her to help her with this was Mark’s book You Are Your Own Gym. It never occurred to me until recently how relevant and useful his workouts and techniques were for me (after all, I have a pretty comprehensive home gym). Then came PiYo, Weider Ruthless and BodyFit 360 showing me the value of building strength with nothing but my body. EFX was my first Mark Lauren purchase for myself, but I plan to get the rest of his workouts (and books + I have already downloaded his app). EFX is unique, high quality and overall impressive. In the intro, Mark describes the purpose of EFX: to train you in the ability to maintain proper body alignment while moving in all planes of motion; it is functional fitness, however form and control are paramount. I do not plan to post this review until I have completed two weeks of EFX (therefore doing all of the workouts twice). But I do have to say, after completing the first week, these workouts are amazing. They challenge me in new ways. In addition to writing bestselling fitness books and creating 4 workout DVD programs, Mark was a US Special Operations trainer (maybe he still is?). Here is a bio about him; it’s actually pretty impressive. EFX consists of 3 workouts. Each workout has 9 exercises that are broken down into 3 complexes. Each complex is repeated 3 times. The warm up and cool down are the same for all 3 workouts. The workouts themselves are 33-40 minutes long. Before each complex begins, each exercise in the complex is demonstrated by Mark to make certain you are completely clear on form so that you can execute every rep properly. You are also shown a diagram of the body that indicates what muscle groups are worked by each exercise, what function and/or sports activity/movement each exercise helps with, and what plane of motion you are working with each exercise. Now, you don’t do a lot of reps of each exercise; however, none of these exercises are done quickly. They are all done at a slow and controlled pace. For instance a simple squat is done very low and held at the bottom of the move before rising. The workouts appear easier than they actually are. Plus it is cumulative. By the time I got to the third complex I was always breathing hard and my muscles were fatigued. This system is all about form and technique. Mark goes to a lot of trouble to demonstrate form and his is perfect. He is one of those trainers that does every single rep of every single exercise. His form is always perfect for every single rep, even when it is obvious that he is working hard and fatiguing himself. Due to the pace, you have the time to correct your form for each rep. That’s what makes these workouts surprisingly challenging and effective. BTW–by the time I completed the first week, I hated Skydivers (2nd exercise in complex 3 of all 3 workouts–but different arm variations each time). Skydivers hurt. But it is clearly an effective exercise because I always feel it all over the back side of my body. EFX is apparently a fitness program tho no literature comes with it. The DVD case states it is a “60-Day Total Body Transformation” and in his introduction he tells you to do Workout #1 on Monday, Workout #2 on Wednesday and Workout # 3 on Friday. I guess you do that for 60 days. Plus he has nutrition information on his website plus a lot of other information and a forum. As for Mark Lauren himself, I really like him. He has a commanding, yet relaxing presence. He motivates me and makes me want to mirror his perfect form. I also liked the pace of the workouts. The somewhat slower pace really gave me the time to focus on my form in a way I never have before. In addition, you get recovery periods to regroup after taxing yourself so hard. For instance, between each round in a complex you get a brief recovery. Between each complex you get a longer recovery as the exercises are demonstrated. I am at the end of the two weeks and getting ready to post this, so I want to add a little aside before I post. I am reading his book Body By You and I have to say, he really has me sold on bodyweight training. I am getting You Are Your Own Gym, too–but this one is a shorter, quicker read and geared for females, so I started there. Reading his book, reviewing his app and doing EFX have actually given me all new fitness goals. For example, I am now determined to do a full unassisted pistol squat. With the help of his programs, I think it might actually happen. Yes, I have drank the Kool-Aid. Warm up 4:30 minutes. Down dog. Alternate heel presses while still in down dog. Go into runners lunge then straighten front knee; drop down into low runners lunge with elbow on floor; repeat. Raise to Warrior 1, arms overhead. Repeat from runners lunge on other side of body. Vertical arm flings. Horizontal arm flings. Cool Down 12:30 minutes. The stretch starts with an odd and uncomfortable (but probably effective) stretch. I don’t know the name of the stretch so I will just describe it (though it reminds of “scorpion” type of exercises). You lie on your stomach, stretch one arm out to side with elbow bent at 90 degree angle; bend opposite knee and lift, then push up with other hand, twisting body and raised foot toward bent elbow on floor–if it sounds awkward, it is, and uncomfortable, too. Next is child’s pose, except he presses the upper body down, but your buttocks don’t rest on heels/floor (they stay raised). Hamstring/calf stretches done on one knee with one leg straight. Sit on bottom with legs spread wide in a V and straight–you will do several stretches in this position. “Z” stretch: while still in position of last stretch, bring one heel in toward crotch, bend the other knee in the opposite direction so your other heel is near your bottom; lie over the top of your front leg, stretching your hip. Staying in same leg position, lean upper body back and to the side (toward front leg) so you are on your elbow and twisting your body, stretching quad of back leg. Legs still in same position, reach back and grab your ankle that is behind you, fall back onto forearm and, while letting your head hang, slowly nod head (neck stretch). End with pigeon. Complex 1: 1. T Squat: deep squat with arms held straight out to side (5 reps); 2. Starfish: side plank to push up (5 reps each side); 3. Jumpslide: a plyo squat jump, side step wide to right, plyo squat jump and step back to start (5 reps). Complex 2: 1. Split Squat with open rotation: 180 degree jump lunges (5 reps); 2. Tripod Scissor Kick: forearm plank with wide feet; lift one leg and bring it in to meet the other, then back out (5 reps each side); 3. Speed Skater (5 reps). Complex 3: 1. Low Lunge w/ internal/external rotation of back knee: get into low lunge and (while holding in low static lunge) rotate the back knee out then back in (5 reps each side); 2. Skydiver with arms at T: lay on stomach and raise arms out to side in a T and legs wide and off the ground; you hold this position for 20 seconds then scissor kick legs for 40 seconds; 3. Body Rock: forearm plank; rock back in forth while remaining in forearm plank (do this for 1 minute). Complex 1: 1. Y Squat (same as T squat in Workout #1 but arms are held in Y) (5 reps); 2. Contra Press Up: lay on stomach, left hand under left shoulder; bring right knee up and bent and grab right hamstring; do one arm push ups in that position (5 reps each side); 3. Liberty Back Hand (balance move): standing, raise right arm over head and raise right knee; bend right leg behind you, reaching right arm across body (5 reps each side). Complex 2: 1. Clock Jump: 180 degree (at least–more if you can) squat jumps (5 reps each side); 2. Side Pillar Reach: in side elbow plank, reach top arm to ceiling then underneath body, rotating hips (5 reps each side); 3. Lateral Lunge: deep side lunges side-to-side (5 reps). Complex 3: 1. Saxon Lunge: get into deep low lunge with both arms overhead; reach toward ground with one hand and (try to) touch the ground, then touch the ground with other hand (5 reps each side); 2. Skydiver with arms at Y: lay on stomach, arms, chest and legs wide and off the ground; hold in this position for 20 seconds then for 40 seconds scissor kick; 3. Reaching Body Rock: the same as the Body Rock in Workout #1, except at the forward push of the move you reach forward with one arm, alternating arms (do this for 1 minute). Complex 1: 1. Streamline Squat: deep squat with arms held straight overhead, palms together (5 reps); 2. Tripod Push Up: in wide-leg plank, lift one leg and do push ups (5 reps each leg elevated); 3. Seesaw: this is a balance move; feet together, arms at T position, elevate one leg while leaning forward, keeping body in straight line, twist body to one side, then come back to standing (5 reps each leg). Complex 2: 1. Split Squat with Closed Rotation: in low lunge you do a jump lunge except you do not switch legs (I did this wrong the first time I did the workout–much harder move when you do it properly! ), after you jump, then you switch legs and jump back to starting position (again, do not switch legs as you jump) (5 reps); 2. Side Pillar Knee Tuck: get into side elbow plank, bottom leg in front of top leg, raise bottom knee to chest (5 reps each side); 3. Double Lateral Jump: (balance move) stand on one leg and jump twice to side and twice back to start (5 reps each leg). Complex 3: 1. Low Lunge with Internal/External Rotation of back leg: get in low lunge with arms held straight overhead, palms together, rotate back leg out as far as possible, rotate in as far as possible (5 reps each leg); 2. Skydiver with Arms at Side: this is the same as the skydivers in Workout 1 & Workout 2, only with different arm position–for this one, arms are held at their lowest position; hold skydiver for 20 seconds then scissor kick legs for 40 seconds; 3. Pillar Reach: get into forearm plank, take one arm and reach under the torso as far as you can then take that same arm and reach to ceiling (keep hips stationary throughout); alternate sides for a minute. I think so. Mark Lauren does the best body weight strength training workouts and in my opinion this one is his best. But YAYOG is excellent, too–especially the advanced workouts. I would consider those as well if you are unable to lift any dumbbells for an extended period of time. But if I could only have one, it would be EFX. Hi! I want to buy a Mark Lauren DVD(s). Which one do you prefer? EFX is my favorite of all of the Mark Lauren workout programs, however YAYOG is the most comprehensive program he has. That one will take you from beginner to advanced. They are both excellent, but EFX is my preferred program.